Rapid Pan and Planetary Concrete Mixers Replace Ribbon Mixers Resulting in Improved Quality of Concrete. General Shale, a concrete masonry products producer based in Tennessee, USA, recently decided to replace their ribbon mixer with a Rapid RP2000 planetary concrete mixer. Having been greatly impressed with the planetary concrete mixer’s fast mixing times and the quality of the concrete produced, General Shale subsequently replaced a second ribbon mixer with a Rapid pan concrete mixer. General Shale approached Standley Batch Systems, one of Rapid’s US concrete mixer dealer partners with fifteen years experience installing Rapid mixers throughout the United States. 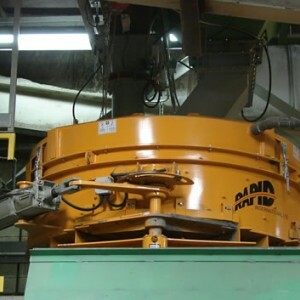 First and foremost, the company were concerned that their ribbon mixers produced concrete with too many unmixed particles and which did not meet with their quality standards. Standley Batch Systems were on hand to advise them on the best replacement options and guide them through the entire installation process. The Company decided to replace one of their ribbon mixers with Rapid’s RP2000 planetary concrete mixer – a powerful mixer which creates a more consistent mix and offers the ability to add several color blending options. Once the existing ribbon mixer was removed, it was important that the new equipment was integrated with General Shale’s existing equipment; this involved installing new support beams and feed chutes. The installation was finalised when Standley Batch Systems wired the new control, which came with the new mixer, and piped in the new water line. General Shale also took the opportunity to add a new moisture sensor. This sensor controls the amount of moisture in each batch, which helps create a more homogeneous mix. From start to finish, the replacement process took about one week. The new Rapid planetary concrete mixer now offers General Shale fast mixing times with increased concrete production and a consistent, top quality mix. General Shale were so impressed with the results of their new Rapid planetary concrete mixer; they contacted Standley Batch Systems to replace another unit in their Lintel plant. Although the new plant had a much different layout, Standley Batch was again able to take a concept drawing and custom fit the new two-door Rapid R500 pan concrete mixer that supplies the Lintel machine. The team removed the Lintel machine to allow easier access to the concrete mixer, then cut the support platform loose from the old mixer and used the forklift to remove it from the building. The new mixer platform was then installed one beam at a time. The Lintel machine feed chute was modified to accommodate the door from the Rapid Mixer. Load cells, two slide gates and two new feed chutes were added to the mixer and a stainless steel hopper was also installed, as well as grating, handrails, toe plates and a set of stairs to the new mixer platform. A local electric company wired the load cells, gates and mixer. General Shale installed all of the air and water pipes to the new mixer. Standley Batch leads the industry in manufacturing material handling equipment for the concrete industry. They also provide custom equipment and installation for precast, block and paver plants. Standley Batch is the primary distributor of Rapid International Ltd Concrete Mixers in the U.S. Northern Ireland based Rapid International Ltd has manufactured products for the concrete, construction and environmental industries for over forty years and boasts an award winning product portfolio with sales extending to over twenty countries globally. Rapid International is dedicated to total quality and continuous improvement of design, manufacture and productivity.